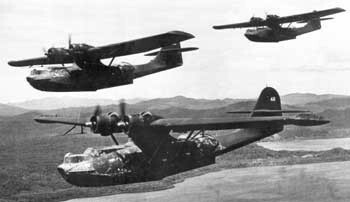 The US Navy Bombers is the story of Catalina 'Black Cat' PBY, TBF Avenger, PBJ, and Brewster SB2A-4 'Buccaneer' bombers during WWII. Six films are included on this DVD. Film #1 - Black Cat PBY. What was that mysterious plane swooping down out of the night sky on unsuspecting Japanese ships and bases, hundreds of miles from any known American airstrip? The answer was, as you'll see in this good humored, affectionate film, the slow, ungainly, but deadly 'Black Cat' PBY. Originally designed primarily as a reconnaissance and antisubmarine amphibious patrol plane, the big twin engined Catalina's super long range, all weather capability, capacity to lug both bombs and radar, ability to loiter for hours hunting convoys and operate from anywhere in the watery PTO, made it an ideal naval night attack bomber. One of the least known stories of the war in the Pacific, these black painted PBY 'VPB' ('Patrol Bombing') squadrons spread destruction and chaos far out of proportion to their relatively small numbers. A frequent tactic was to cut their engines and float in almost silently on their prey. As this film shows, night ops were very risky, but the rewards could be huge, including the sinking of a 6,000 ton Katori class light cruiser by Lt. William B Sumpler, of VPB-33, for which he was awarded the Navy Cross. In B+W with a run time of about 20 minutes. Film #2 - Aerial Torpedo Attack - High Speed High Altitude. Every once in a while, a previously unknown film comes out of the past that raises the curtain on a forgotten chapter of military history. This film does just that, illuminating the science of naval aerial torpedo attacks. Originally developed to educate pilots about newly developed torpedoes that could be dropped from higher (and therefore less vulnerable) altitudes and speeds, the film also gives a through grounding in torpedo attacks in general. You;ll learn about depth setting, range estimation, target angles, leading the target, the effect of crosswinds, working with fighters and dive bombers during an attack, using radar, countering evasive ship maneuvers and much more. You'll also see how far we've come from an analog world where printed charts were cross referenced during combat. All in all, a very interesting and revealing film. In B&W with a run time of about 30 minutes. Film #3 - Flying the TBF Avenger. The Grumman TBF/TBM 'Avenger' Torpedo Bomber. This was Dubya's Dad's WWII ride. The Avenger was a tough and accurate bomber that had a reputation for taking punishment and bringing its crew home. Relatively easy to fly, the big Avenger was surprisingly nimble. The TBF could pack up to 500 lb bombs or one Mk1 13-2 torpedo, and with all three tanks topped up with 335 gallons of fuel, could strike targets up to 260 miles away. More than 7,500 TBF/TBM Avengers were produced in 20 variants, which fought with distinction in most major naval battles in the Pacific and was well liked by the Royal Navy. In B+W with a run time of about 24 minutes. Film #4 - The Brewster SB2A-4 Buccaneer Scout/Dive Bomber. Was it really 'the worst aircraft of World War II'? See the video and judge for yourself! (Look for the little clues in the narration.) Though this training film goes out of its way to sing the Buccaneer's praises, her flaws are all too obvious if you watch and listen carefully. Even so, many Marine trainee pilots learned the ropes of dive bombing in the big Brewster. In B+W with a run time of about 17 minutes. Film #5 - Introduction to Dive Bombing. Before you leave the deck in that Dauntless, you'd better learn how to dive bomb properly. The US Navy pioneered dive bombing techniques after World War I and it shows in this informative film, produced by the Department of the Navy in 1943. You'll learn everything from the basic theory of dive bombing to how to put your egg on a real target, including ships at sea. In B+W with a run time of about 24 minutes. Film #6 - Deploying Aerial Mines. This film describes World War II aerial mine warfare at sea,. You'll learn the basics of mine laying, including strategy and tactics. You'll also find out how mines were fused and armed to be ready for deployment, along with detailed diagrams of their inner workings. You'll see rare footage of actual aerial mine laying missions by PBJs in the Pacific. Although seldom dealt with in general histories of World War II, aerial mines were often used with deadly effect by both Axis and Allied forces. In B+W with a run time of about 17 minutes.